Chachapoyas, in the North of Peru, is the capital city of the Province of Chachapoyas, in the Department of Amazonas. It is situated on the Oriental slopes of the Andes´ Cordillera, on a plain, in the basin of the Utcubamba River which is a tributary of the Marañón River, where the pre-Incan Chachapoya Culture developed and built the already famous fortified city of Kuelap, in the Province of Luya, in the Northeastern Peruvian Andes. Kuélap or Cuélap is an important pre-Incan architectural complex built with large stones that give it a monumental aspect, as it presents a 600-meter (1968-feet) long artificial platform, oriented from South to North, and seated upon the calcareous rock crest, on top of Mount Barreta, at 3,000 meters (9,842 feet) above sea level. 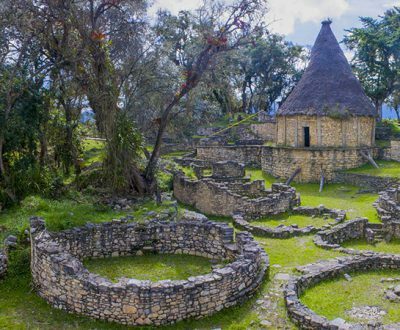 It is estimated that its construction must have begun around the 11th century, which coincides with the Chachapoya Culture´s flourishing period, and it is thought that it was occupied until the middle of the 16th century. Its colossal fortified walls and complex architecture are evidences of its function, as a stronghold, and of its occupation by a well-organized population, as it includes enclosures for administrative and religious use, as well as living quarters, while its exceptional location highlights evident defensive features against eventual enemy or rebel ethnic groups´ attacks. The most relevant buildings, due to their impressive architecture, are the “Tower”, the purpose of which was defensive, the “Tintero” (Inkwell) , with its inverted cone-like shape, that looks like a mausoleum, where funerary rituals were performed, and the “Castle” that must have been the residence of the highest ranking ruler or High Priest. From its heights, the green landscape displays the dense vegetation that surrounds it, and is the habitat of a great diversity of wild animals and birds. So, we could say that Kuélap is the visitor´s best opportunity for an adventure to an extraordinary place, very close to the sky.